Experimental hip hop group Death Grips have just dropped a six-track instrumental EP over on their SoundCloud. For Death Grips fans the world over, the twisted tracks themselves won’t be entirely unfamiliar: the EP is essentially the soundtrack to their weird, half hour “Interview 2016” video broken up into six parts. Released earlier this month and directed by Death Grips themselves, the video is a bit of a mind-bender, featuring celebrity interviewer Matthew Hoffman talking to the group “backstage” after a show, with the entire visual tinged green. The weirdest bit? All dialogue from the video has been totally stripped out and replaced by the high-octane, jarring, frenetic instrumental that makes up the tracklisting for Instrumental 2016. 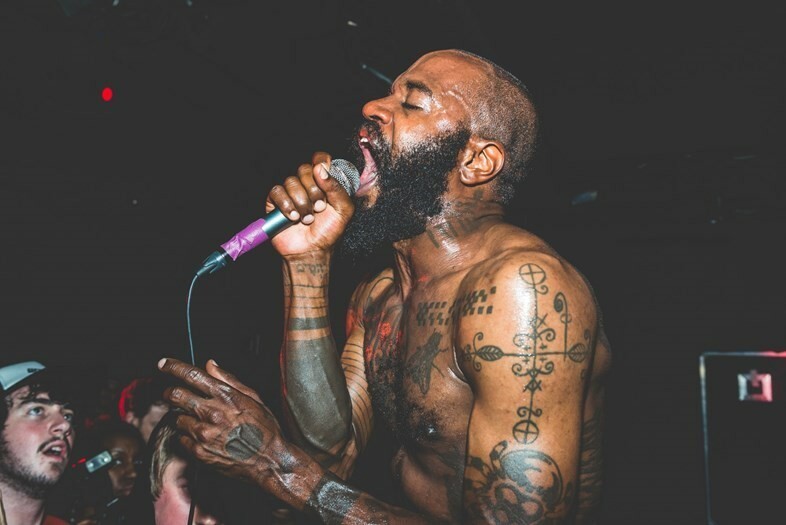 Today's drop on Soundcloud comes as the latest in a list of teasers that Death Grips have been feeding us since October 2015 when they announced the impending release of new album Bottomless Pit. Since then we’ve been given one track, “Hot Head”, from the album, plus its entire track listing and artwork. It’s not entirely clear if “Instrumental 2016” will end up featured on Bottomless Pit or not, but, either way, it’s a reminder of their imminent return.